The height of any finished external balustrade or railing needs to be a minimum of 1100mm above the finished floor level, or above where one can stand. This is according to BS6180:2011 – Barriers in and about buildings code of practice. Not always is fixing balustrades a simple matter. This is because usually the finished floor level does not have a structural member to fit to. Structural members are often imbedded below the floor level, under insulation, screed, waterproofing etc. Trying to fix to the top finished floor will not give a suitably strong connection. Fixing after waterproofing requires resealing or special measures to stop water ingress. If fixing in advance, you do not the exact finish floor height at that stage in the process. Fixing a finished system early leads to risk of damage to the product. And for these reasons the Hybrid two-part posts system works a treat. Structural post – The hidden structural posts, also known as the primary post. Made from galvanised steel with a thick baseplate, this is the strong part of the post. System post – The visible system posts, these are the posts that you will see after the system is installed. They are the same finish and colour as the handrails and base rails. The structural post can be fitted at an early stage, before water proofing, before screen, before insulation and whilst the structural elements of the floor/building are exposed. The structural post is covered and sheathed by the final system post with telescopic adjustment –meaning you can be safe in not knowing the exact finished floor height at the stage when you need to install the structural post. The structural post is NOT the finished product and can be installed whilst “dirty” work is still being undertaken on site. Structural posts can be waterproofed together with the roof or terrace. Installing the structural posts early allows all other trades a clear position of the balustrade and all finishing can be done. 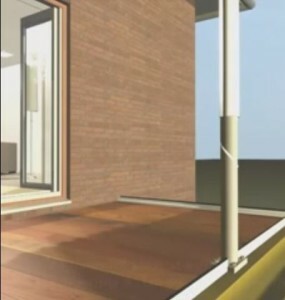 No matter where the start level is, even if its 50mm or as much as 400mm below the final floor level, the telescopic hybrid system allows you to maintain structural integrity and easily maintain the correct height. The primary post can be fitted directly to the structure, for a solid sound structural fixing, ready to take the system post (the aluminium sheathing post), which creates the finished look. Of course, minor fluctuations in the fixing point for the main structural post won’t matter as the height can be set by the sheathing, which works from the finished floor level making sure the final look and finish looks perfect. The structural fittings can be fitted before or after depending on the solution required. But if they are being fitted early in the construction, there’s less concern about damage, because the final fitting is done at a stage when most or all the messy work is complete, so either way it’s easier to install and there’s less likelihood of damage. The majority of our structural posts are held in stock and available off the shelf, this allows quick delivery at the critical early stage to get a good and solid fix to the building. Giving you peace of mind that it will all fit and work. « Are Balustrades the Next Grenfell Disaster Waiting to Happen?